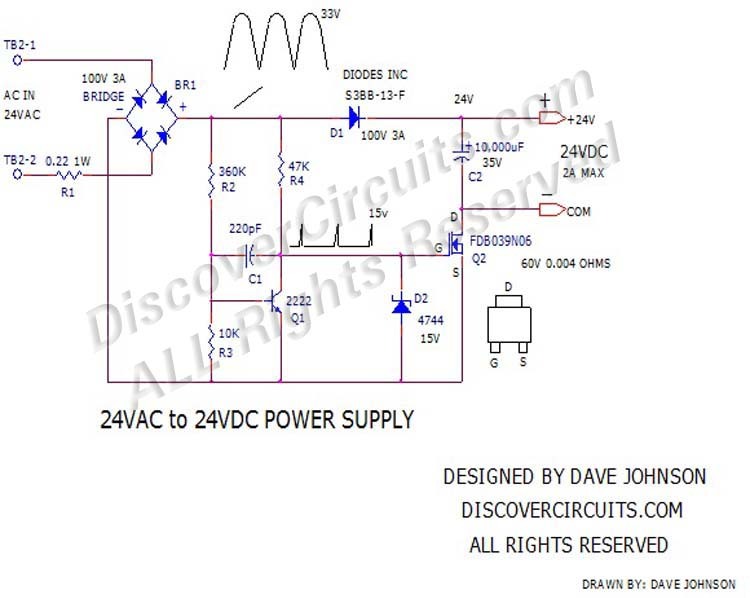 The idea for the circuit below came from a company needing to power several 24v DC LED assemblies from an existing 24vac supply. They did not need a rock solid and regulated 24 volts but a voltage which hovered around that voltage. Running the AC through a bridge rectifier and a filter capacitor would have produced a voltage over 30v. They needed something with a bit of regulation, since the 24vac could vary by +-10%. The circuit below will generate a 24v DC supply with just a bit of ripple voltage. It is rated at 2 Amps. The circuit works by opening and closing a switch routing DC pulses into the energy storage capacitor C2. The transistor Q2 is turned on when the voltage from the bridge rectifier is below 26v. This allows C2 to charge up to about 25 volts. As the bridge voltage increases, the transistor Q1 then starts turning on, which in turn turns off Q2. The result is a voltage across C2 which is pumped up to about 25 volts and is discharged to about 23 volts before the next cycle. The average voltage is pretty close to 24 volts.